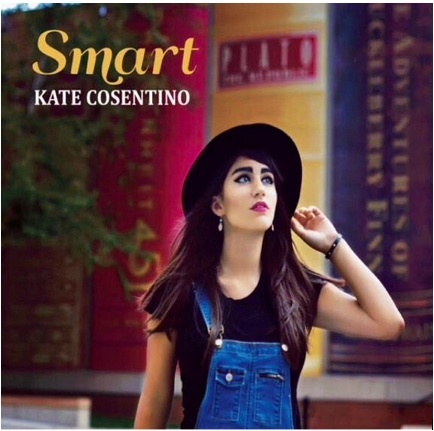 Cover of Kate Cosentino's new EP 'Smart." The entire album or individual songs are available on iTunes. For many, singing and performing is just an interest, but a talented sophomore has turned that interest into a passion. Sophomore Kate Cosentino released her second EP on Friday, Jan. 30. An event to celebrate the release was held at RC’s Backdoor in Martin City, at 7 pm. Cosentino played all the songs from her new EP “Smart,” featuring The Slowdown and Wonderfuzz. “I’ve been musically inclined since I was very little,” Cosentino said. Cosentino started singing lessons in first grade, and released her first album, “Too Many Love Songs” consisting of eight original songs when she was 13. Cosentino’s original piece “Just Remember” won the UK Songwriting Contest in the under 18 category last month. She loves to write music in her bedroom, coffee shops, parks, and unique and interesting places. Inspiration for her music comes from random events and thoughts, actions of others around her, and just daily life. Cosentino has been writing the songs for “Smart” since last winter, and she recorded it in August in Nashville. She loves the creativity and brilliance of the recording process and this album is special to her because it is filled out with a full band. The EP is entitled “Smart” because it is her favorite song in the EP, it is the most personal, and she enjoys the various meanings of the word. As a performer, Cosentino loved the music release of her EP. “It was like a legitimate alternative concert, with the crowd up against the stage, and a full band.” Cosentino said. The sophomore has also performed on Fox 4 and in the KC Superstar competition was she was just named as a semi-finalist last week. All of Cosentino’s music from “Too Many Love Songs”, “Smart” and her single “Mister J” are available on iTunes. Cover of Kate Cosentino’s new EP ‘Smart.” The entire album or individual songs are available on iTunes.